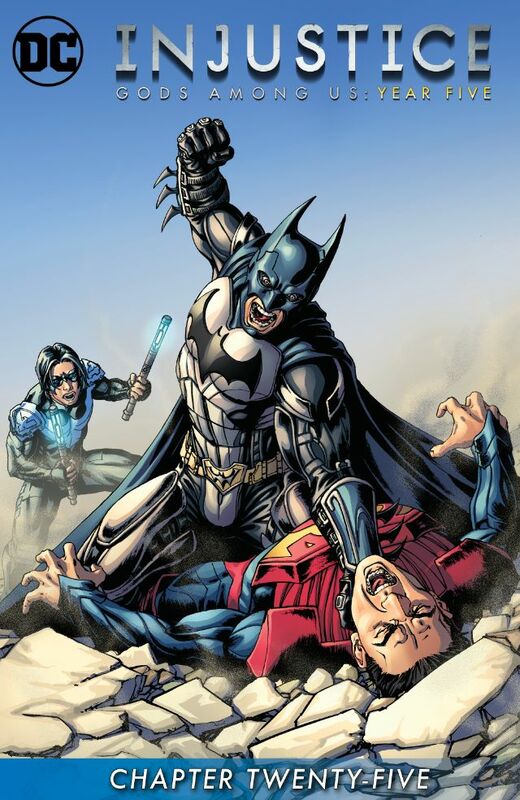 Batman and Regime Superman fight. Despite all of his great powers, Regime is at Batman's mercy, and the enraged Dark Knight asks his son if he should kill him. Story - 1: Was the outcome ever in doubt? Once the green pill - wait, wasn't this pill supposed to be gone? Yet Harley Quinn has a bottle of them, and Batman has just one more, so we get this. My biggest disappointment is that Batman is even questioning killing Regime, which is ludicrous. What is the point of this issue? To make up for the beating Batman took in Year One, issue #24? To have more bloodied and puffy faced images of Superman, for the battle boards to rage over? It surely wasn't to develop any character or move along the plot, which was left back in Year Two. Just a waste of time and space. Art - 3: Blood. Punch. Looks nice. Cover Art - 4: I liked it, I can't say more than that.